We are in the seaside town of Folkestone today collecting funds for Kent Greyhound Rescue. This is a great opportunity to come along and meet our volunteer team and ask any questions you may have about rehoming, or about greyhounds/lurchers as pets, or if you would just like to meet some dogs and have a cuddle. We will have some of our lovely dogs looking for homes with us. If you check our facebook page the day before the event we will confirm which dogs will be there. 20apr12:00 pm3:00 pmCountry Music and Dog ShowMusic, dogs and a pub! This lovely dog friendly pub is located in one of Kents ANOB on The Pilgrims Way (near Maidstone) set near 575 of National Trust countryside – a lovely day out over the Easter weekend. Over Easter weekend they have live music and on the Saturday it is Country Music and a dog show. KGR will be there with our stall and some of our dogs looking for homes – what’s not to love, a country pub, dogs and music. The dog show times and classes will be posted soon. Please note we are not organising this event – any enquiries about the music, the dog show or even camping at the pub (if you are coming from further a field or fancy a beer) need to be direct to the Hook and Hatchet Pub, Hucking, Kent. Please check our facebook page on the day to ensure the event is still going ahead (weather) and to see which dogs we will have with us. We are in the seaside town of Rye today collecting funds for Kent Greyhound Rescue. This is a great opportunity to come along and meet our volunteer team and ask any questions you may have about rehoming, or about greyhounds/lurchers as pets, or if you would just like to meet some dogs and have a cuddle. We are in Maidstone (near Marks & Spencers) today collecting funds for Kent Greyhound Rescue. This is a great opportunity to come along and meet our volunteer team and ask any questions you may have about rehoming, or about greyhounds/lurchers as pets, or if you would just like to meet some dogs and have a cuddle. More information to folow about this very popular family fair. We are in the seaside town of Herne Bay today collecting funds for Kent Greyhound Rescue. This is a great opportunity to come along and meet our volunteer team and ask any questions you may have about rehoming, or about greyhounds/lurchers as pets, or if you would just like to meet some dogs and have a cuddle. We are in the seaside town of Deal today collecting funds for Kent Greyhound Rescue. This is a great opportunity to come along and meet our volunteer team and ask any questions you may have about rehoming, or about greyhounds/lurchers as pets, or if you would just like to meet some dogs and have a cuddle. Come and join us at FOAL Farm for the annual Skinny Dogs Day. More info to follow. The times currently shown may not be correct. Kennington Summer Fayre Kenningoton Ulley Road, Kennimgton, Ashford, Kent. Come along and meet us at the annual Kennington Summer Fayre – this is a very traditional family day out that everyone will enjoy – it is held on The Green at Kennington and is supported y lots of local charities – with entertainment in the arena all afternoon. We will have plenty of dogs with us looking for homes – please check our facebook page the day before to see who. If you can help on the day – either on the stall or walking a KGR dog around the event please email us. The dog show is just a bit of fun – it’s not like a traditional show and it’s all about enjoying you day out. Please note we are not organising any of the event so cannot answer any questions about stalls, food or the dog show. Ulley Road, Kennimgton, Ashford, Kent. We are in Canterbury (near Marks & Spencers) today collecting funds for Kent Greyhound Rescue. This is a great opportunity to come along and meet our volunteer team and ask any questions you may have about rehoming, or about greyhounds/lurchers as pets, or if you would just like to meet some dogs and have a cuddle. 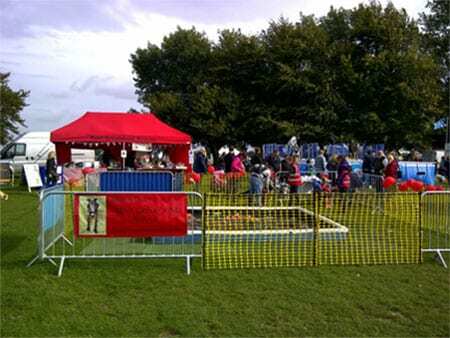 A fantastic family day out – attractions include: Vintage Car show, Beer Tent, Country Market, Gardening Society, Bouncy Castle, Cake Stall and a dog show. Please note we are not organising this event so any enquiries about stalls or show classes need to be addressed to the Lions. Kent Greyhound Rescue will be at this event with our stall and some of our dogs looking for homes. We will provide more information neaer to the time. Please note the times are approx. We are in the lovely seaside town of Hythe today collecting funds for Kent Greyhound Rescue. This is a great opportunity to come along and meet our volunteer team and ask any questions you may have about rehoming, or about greyhounds/lurchers as pets, or if you would just like to meet some dogs and have a cuddle. 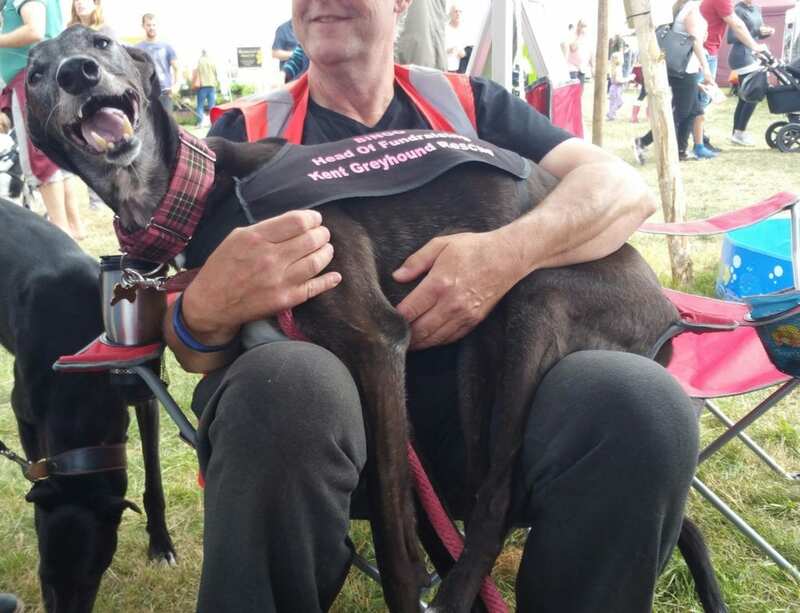 Kent Greyhound Rescue will be Chilham Park with our dogs looking for homes on both the Saturday and Sunday – on the Sunday we also run a dog show on the lawn in front of the castle at 2pm. This is a lovely, relaxing day out for everyone – come and meet us and our dogs and wander around the beautiful grounds of Chilham Park watching the show junoing and dressage. The entry charge is £10 per car (for everyone) but there is a free car park in the village about a 10 minute walk away. Set on the North Downs in the beautiful Kentish village of Chilham and against the beautiful backdrop of Chilham Castle, we look forward to once again see horses and riders compete in the sport of eventing over the mature Chilham Castle parkland designed by Lancelot ‘Capability’ Brown. Entry is free for members of British Eventing otherwise £10 per car (including all passengers). Dressage will be located beside the lake in front of the Castle, with the CIC dressage occurring on the terraced lawns in front of the Castle. The main arena and showjumping will be located at the head of the park overlooking the beautiful Gt Stour Valley with the cross country course start will now be located nearer to and visible from, the lorry park. 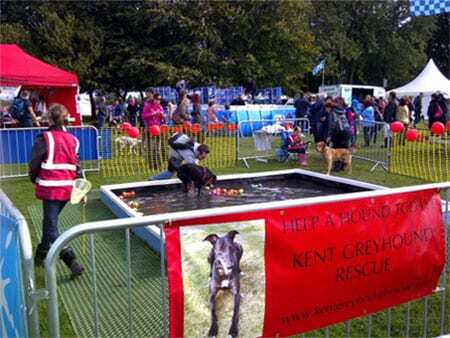 Kent Greyhound Rescue will be Chilham Park with our dogs looking for homes on both the Saturday and Sunday – on the Sunday we also run a fun dog show on the lawn in front of the castle at 2pm. There is a £2 entry donation per dog per class for the dog show and all monies raised help Kent Greyhound Rescue. Come and join us for a weekend of all things rural and country – plus good food, local crafts and of course our KGR dogs looking for homes. More info about this event will be posted nearer the time. We are in the seaside town of Whitsable today collecting funds for Kent Greyhound Rescue. This is a great opportunity to come along and meet our volunteer team and ask any questions you may have about rehoming, or about greyhounds/lurchers as pets, or if you would just like to meet some dogs and have a cuddle. The Quex Park Country Show will have something for everybody. Whatever you want, this show will have it. If you love Country Shows, come along and see Jonathan Marshall horseback stuntsman from Poldark and Game of Thrones, the Rocket Motorbike Stunt Team, fabulous falconry displays or if you are a foodie take the time to watch some amazing cookery demonstrations or meet our wonderful producers, taste and buy. Why not buy yourself something a little different at the show with our wonderful array of shopping stands, learn more about Rural Crafter’s and watch them demonstrate their skills including the National Chainsaw Carving Championship. Loads for the little ones to do in our Festivals of Kids, let them meet and greet at Gemma’s Petting Farm or visit Amazing Reptiles, watch our Circus Aerial display or cheer on with our fun wrestling shows. Love Classic Cars this is the show for you. There will be the dog show with lots of fun clases for all breeds of dogs plus our tea tent with lots of homemade goodies both sweet and savoury. We will be selling our full range of coats, fleece coats and rain macs plus Outhwaites coats and Hunter Wax jackets. Plus handmade knitted jumpers, snoods, harnesses, collar and leads, and our full range of toys. Infact everything you could need for your dog. We will also be having a tombola, a raffle and some really nice stalls selling great stuff.